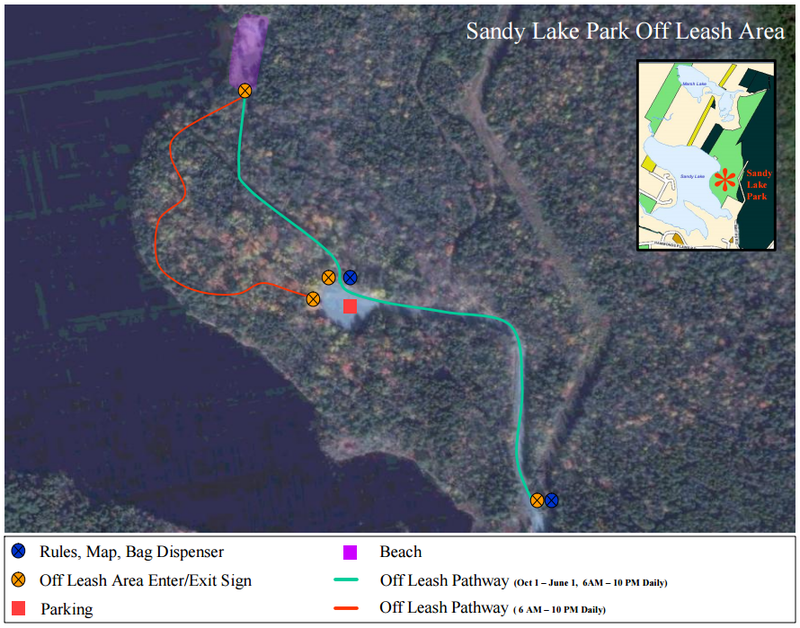 Sandy Lake Park has two different “modes”: off-season and beach season. During the off-season, almost all of the park is off-leash. The only exception is the beach. Dogs aren’t allowed on the beach any time of year, even if they’re on a leash. We’re okay with that, since the off-leash area is so wonderful. When the beach is open (July 1 to September 30), the off-leash area is smaller (only the red trail on the map below is off-leash). But it’s actually quite a nice, big wooded area, and you can access the lake to take your dog for a swim. From the Bicentennial Highway (Hwy 102, or the “Bi-Hi”), take exit 3A to Hammonds Plains Road/Nova Scotia 213. Keep left at the fork, and then take your first right turn onto Smiths Road. The park entrance is at the end of Smiths Road.